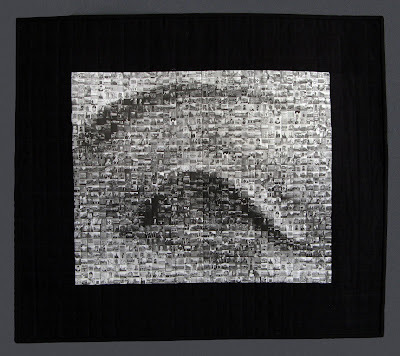 ... and now for fiber arts beyond quilting! The Red Sky Gallery in Charlotte is showing a collection of Janet's beadwork! 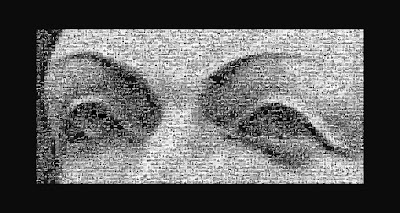 Click over and search for Janet Lasher on their search tab! 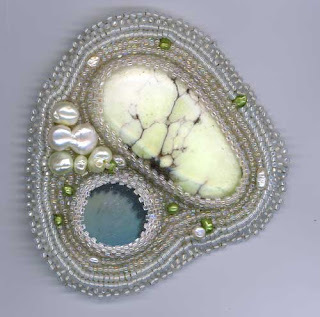 This collection of beaded brooches using large cabochons, Austrian crystals, semi-precious stones, and pearls. 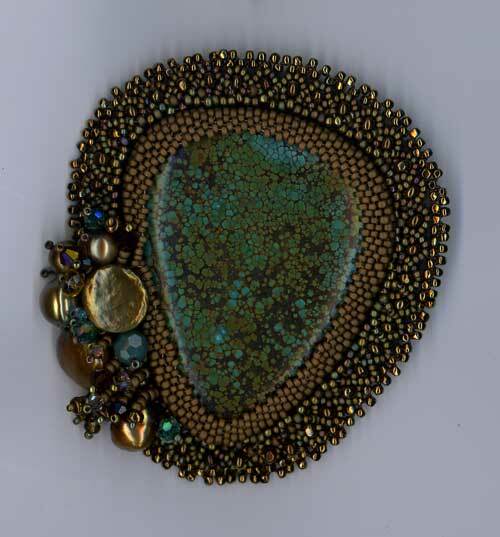 Each piece is unique designed to accentuate the cabochon stone. These vary in size from about 2.5" to 4" across. Janet starts with the special stone and a small collection of beads, crystals, pearls, and stones - beading a bezel around the stone to hold it firmly in place, and then begin to embellish the piece until it feels done. Then each is finished up with a beaded picot edge and back with coordinating deer leather. She says that this work is a labor of love working in this small scale playing with repetition and color. One bead at a time. 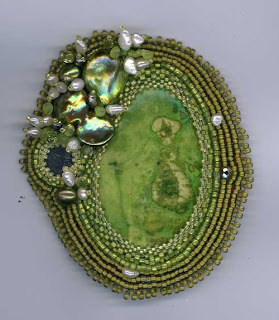 Chystaphase, glass mirror, baroque & fancy pearls. 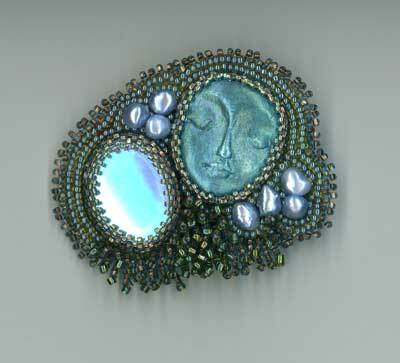 She is expanding the collection of brooches that started using small divine feminine faces- like this one worked on this past fall. For many years, Charlotte (NC) had the reputation as a "tear down" city. We tore down homes, factories, trees - if it was old, it was gone. And we made room for the new: big box stores, strip shopping malls, steel and concrete office buildings, and lots of parking decks. But over the last decade or so, things have begun to change. We still have plenty of new development. Two fabulous examples are the breathtaking Bechtler Museum of Modern Art and the inspiring Havey B. Gantt Center for African American Arts + Culture. But the good news is that we're also starting to protect and celebrate the old. This weekend I'm participating in "ARTevation: Save Our Signs," a show celebrating Charlotte's vintage painted and neon commercial signs. These are the iconic symbols of old roller skating rinks, Mom and Pop restaurants, full service garages, and neighborhood hang-outs. Atherton Mill, 2000 South Blvd. The show is sponsored by the Historic Charlotte, Inc., a non-profit organization that works to promote and protect the region's history, as part of its National Preservation Month celebration. From what I've seen, it's going to be a spectacular show. Plenty of great photography, painting, and a really amazing ceramic artist - all focusing their work around the sign theme. I'll be the only fabric artist, so that's exciting. 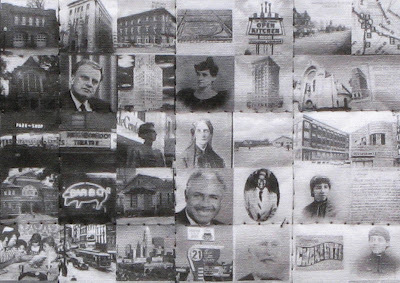 The signs have a way of getting into your psyche; some of the artists moved away from the city years ago and still find themselves returning to those images for inspiration. Close-up, the viewer sees 1/2" x 1/2" photos of Charlotte people, places, and events...and of course the vintage signs. 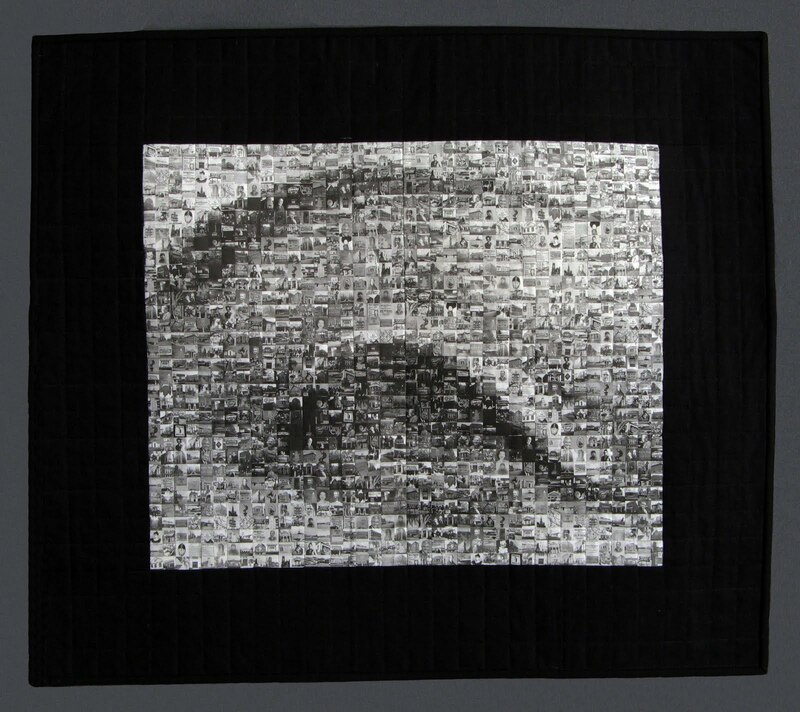 They're printed on fabric and then pieced together to make up the larger image. 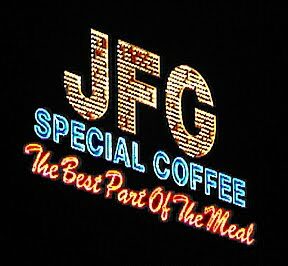 The other pieces focus primarily on the signs themselves....such as this one, of the JFG coffee sign (photo: Brandon Uttley). It turns out that the removal of the JFG coffee sign, a longtime and much beloved Charlotte landmark, was the catalyst for the "Save Our Signs" movement. This has become a joint venture between Historic Charlotte and the JFG Coffee Company (they're putting up to $15,000 towards the effort to help save and restore some of these vintage signs). For those interested in historic preservation, at least one happy ending is coming soon. The JFG sign is being restored and the company is about to announce the sign's new Charlotte location. Watch for an update on (and pictures from) the show. And, of course, if you're in the neighborhood be sure to stop by and enjoy the artwork.